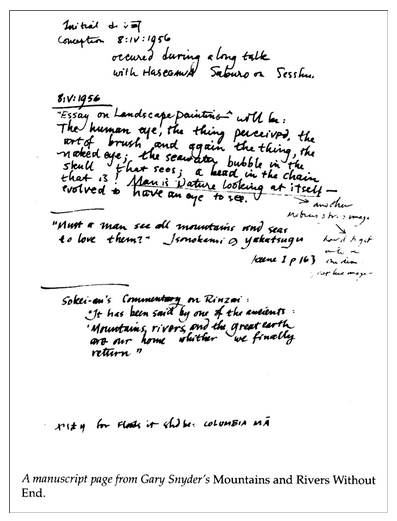 On the next page [of Snyder’s “The Making of Mountains and Rivers Without End” (M&R 153–158)] he tells us, usefully, that he began the poem on April 8, 1956, and though he doesn’t claim to have finished it on April 8, 1996, he does describe giving a party on that date to celebrate the completion of the project. Like Louis Armstrong’s claiming to be born on the 4th of July, this suggests a desire to see life through mythic patterns, or to make them. It’s also an interesting take on Gary’s precision and discipline. Today, on the 4th of July, I am reading Robin Cheng Tsing Tsai’s article on “The Ethics of Translation” (Ariel: A Review of International English Literature 40 , 63–88) and she says the “initial conception” of Mountains and Rivers Without End occurred on April 4, 1956 “during a long talk with Hasegawa Saburo on Sesshu.” Both Tsai and Eric Smith (whom he cites) reference page 88 of Eliot Weinberger’s Paris Review interview with Snyder as the source of this information. Wait! On April 4? So I go to Eric Todd Smith’s excellent Western Writers Series booklet, Reading Gary Snyder’s Mountains and Rivers Without End (Idaho: Boise State University Western, 2000), and see that on page 11 he does indeed say April 4, 1956. Did Gary change the date from April 4 to April 8 as part of “a desire to see life through mythic patterns, or to make them”? And how did I not notice this before? Strange. So I go to my file cabinet and pull out my photocopy of the Paris Review interview. I find no reference to Hasegawa, nor do I find page 88. What’s going on? After a bit of confusion, I deduce I failed to copy the page immediately preceding the interview title page (“Gary Snyder: The Art of Poetry LXXIV”). What was on that page? Ah! All’s well. There was just a misreading of the date: 8:IV:1956 is April 8, 1956: Shakyamuni Buddha’s rebirthday, celebrated as hanamatsuri in Japanese. This is celebrated in most of East Asia on the 8th day of the fourth month in the Chinese lunar calendar. However, Japan adopted the Gregorian calendar during the Meiji Restoration and so the designated (mythic) date is April 8 there and on Turtle Island. 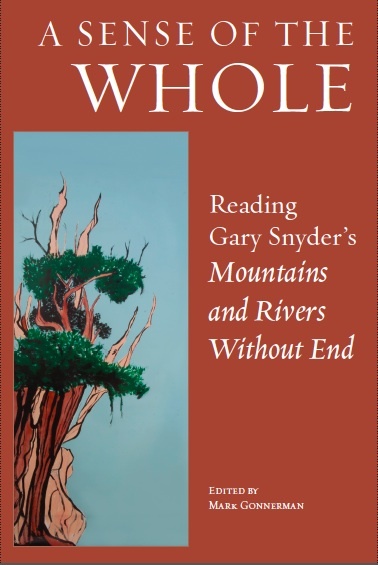 • An audio file of Eliot Weinberger’s interview with Gary Snyder for the Winter 1996 Paris Review is available on YouTube.